The Khan Academy knowledge map got me thinking about this recently, but the basic question at the heart of this Institute has been on my mind for a very long time. Does it make sense to study decimals before fractions? The Khan Academy knowledge map. Decimals lie beneath addition and subtraction in the hierarchy. Fractions are not in this part of the map; they are far off to the lower left. We do not have to answer that question right away. Indeed I do not think that there is a simple answer. I will argue in the coming weeks that the preponderance of theoretical and empirical evidence points to no. You are not obligated to agree with me. You can talk all you want about “tens” and “tenths” but if we don’t have a common language of fractions, you’re talking nonsense. And if you want to claim that a “tenth” is the thing you need ten of to make a whole, then I will need to know what a “hundredth” is. But seriously, what is your explanation for why one tenth is the best fraction to study first? Now, Twitter is a medium that makes nuance difficult. So let’s strive to find nuance, subtlety and complexity in this conversation. That last question is an important one for me. Traditionally, U.S. curriculum has had students working with decimals before they work seriously with fractions. Khan Academy isn’t going against the curricular flow in this area. What this means is that one-tenth is the first fraction students study. Is this justified? Place value. Decimals are the logical extension of the whole-number place value system. Just as you go from 1 to 10 to 100 by moving one place to the left, you also go from 100 to 10 to 1 by moving one place to the right. When you move left, the value of the place is multiplied by a factor of 10; when you move right, the value of the place is divided by a factor of 10. Decimals just continue that process. Money. Children come to school with experiences involving money. They know what one dollar is; they know that 10 dimes make up a dollar; they have seen $1.25 and can talk about what that means. As a result, decimals are part of children’s everyday experience in a way that (say) sevenths are not. Measurement. Metric measurements (and many but not all Imperial measurements) are expressed in units and tenths of units. Children are familiar with the meaning of “12.2 fluid ounces” or “3.2 meters”. So it makes sense to operate on tenths and hundredths even before formalizing the underlying mathematics of fractions. How say you? Are these powerful arguments for you? Have I missed any arguments in favor of studying decimals before fractions? Do you have evidence to bring to bear on the question of whether it makes sense to study decimals first? Can you provide curricular examples to support (or refute) my claim that U.S. curriculum typically presents decimals before fractions? Can you provide an international perspective for us? Follow this link to the announcement of this course for more information. I get that there is no perfect lesson. Really I do. And I get that students leave my classes with wrong ideas. But the thing is, when I come across these wrong ideas, I try to do something about it. A couple of tweets from the field last week (sender’s tweets are locked, sorry). Now, people get fussy when I fault Khan Academy for bad decimal instruction. If I don’t like the videos, I am told it’s not about the videos; it’s about the exercises. If I don’t like the exercises, I am told there are new ones in the queue. If I don’t like the trial versions of the new ones in the queue, I am told that the particular exercises don’t matter; it’s about the knowledge map. When I say that the knowledge map is flawed, I am told that it doesn’t matter because students can move around in Khan Academy in any way that they like. And then every day kids are going to Khan Academy for help with decimals. Some of these kids, such as the one in the tweets above, are going there independently. And some of them are going there because their entire state is piloting it as a primary instructional resource! Whoa there! they say. Khan Academy isn’t meant to be a primary instructional resource. When I first [learned] about Khan Academy, it was mostly “my teacher said this, but I can’t remember what he said, so I’m going to go check it out on Khan Academy. So it was more of a personal resource. Just to be clear, Khan Academy produced this video. I am not misrepresenting KA here. They are proud to share that a math teacher at a training views Khan Academy as a good primary instructional resource. Now, I have long been critical of textbooks that introduce decimals as though they were a logical extension of the whole number place value system (just ask my students!) I am no fan of what Hung-Hsi Wu calls Textbook School Mathematics. But if you are going to get introduced by the publisher of The New York Times [at about 3:00 in the linked video] as “a true pioneer” who is “breaking down barriers” with “heart”, “guts” and “innovation”, I think you have a responsibility at least as great as that of the average textbook author. You have to strive to do better and you have to pay attention to what people already know. If you are going to repeat that your mission is “a free world-class education for anyone anywhere,” you need to spend some time concentrating on the meaning of world-class, rather than imitating the bad textbooks that presently exist. I have taught many crappy lessons, and I surely have many ahead of me. I do not fault Khan Academy for having a few crappy lessons. But I seek feedback from my students on what they are learning. I consult research on learning for the topics they are struggling with. I collaborate with colleagues near and far to improve my lessons. I do not defend my crappy lessons by calling them unimportant. I own their crappiness. And I strive to do better next time. Think of something complicated that all of the competent adults in your life are equally good at. So what would your life’s dashboard look like? Three stages of mastery in the new Khan Academy dashboard for teachers. Students are organized into rows; content in columns. Is your goal for every adult in your life to master each of these skills? Is it OK for the adults in your life to attain some familiarity with each and to improve throughout their lifetime? Or must the dashboard be solid blue? Additional question: How would you behave differently if life’s dashboard were available on your mobile device or desktop computer? Much of the rhetoric at the New York Times Schools for Tomorrow Conference this past week was based on individualization. The mantra here is alluring. We have been treating time as fixed and mastery as variable. We need to flip that so that everyone attains mastery and the time they take to do it is variable. This was a much retweeted component of Sal Khan’s keynote address (see it at 12:56 in this video). Instead of holding fixed how long you have to learn something and the variable is how well you learn it, do it the other way around. What’s fixed is every student should learn; we should all get to 100%, or 99% on basic exponents before moving on to the negative. And the variable should be how long we have to learn it and when we learn it. The larger idea of which this is a part is competency-based education. Perhaps the principle here is too broad for meaningful debate, but I do think the assumption is worth questioning. My Life’s Dashboard thinking is one way of doing that. Another would be to state some explicit areas for concern. One is equity. We can imagine students cycling endlessly through arithmetic content deemed foundational, and never being given access to (say) algebra. Another area for concern is the power that is given to those who create the knowledge map. 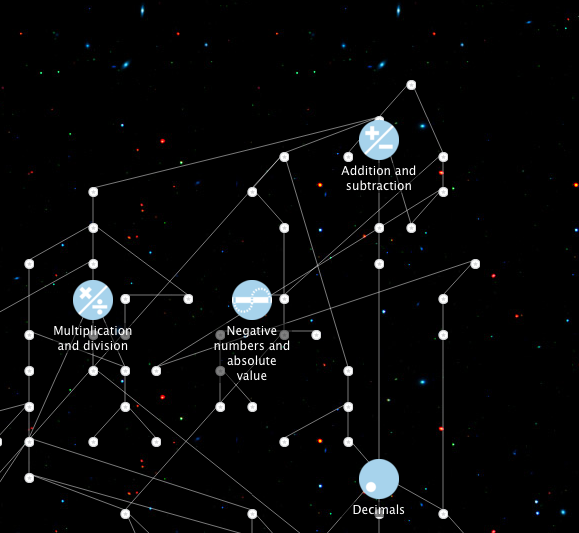 A careful look at the KA knowledge map, for instance, reveals that the prerequisite knowledge for adding decimals consists of addition and subtraction skills together with additive whole number and negative number relationships. Decimals lie beneath addition and subtraction in the hierarchy. Fractions are not even in this part of the map; they are far off to the lower left. The upward connections go to number line and to 4-digit addition. No knowledge of fractions is necessary; no knowledge of the multiplication and division relationships underlying place value, decimals and fractions is necessary. These assumptions about how people learn decimals are flawed, and they are known to be flawed. But powerful people are creating flawed knowledge maps, which then form the basis of the appealing fixed mastery, flexible time meme. I have written multiple times about Cathy Fosnot‘s idea of the landscape of learning. This is a useful metaphor that conflicts in some important ways with Khan Academy’s more linear knowledge map metaphor (and at 9:21 in the video). So I get how appealing this flexible time/fixed mastery thing is. I understand its allure. 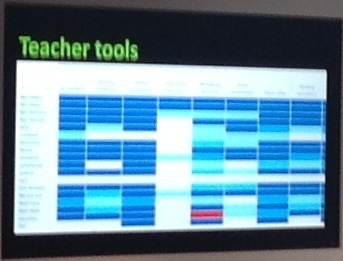 And the idea that we can summarize this information for teachers in a tidy array? Also appealing. But it just isn’t that simple. This conversation happened in New York yesterday. 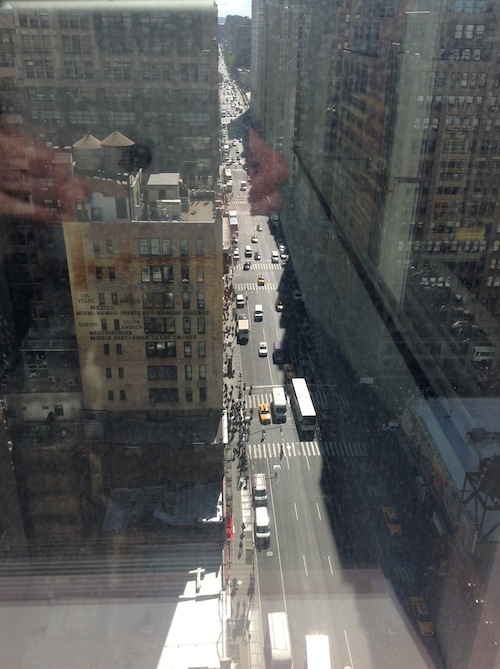 A view of New York City from the Times Center on Tuesday. During a coffee break, I sat down on a white pleather sofa next to an older man. Me: How has your day been? Him: I was president of [small New England college]. How about yourself? Me: I teach math at a community college in Minnesota. But I’m also working on a project. I work with future elementary teachers, so I have studied the mathematical development of children. Me: And I want to use that knowledge for something else, which is this: I am trying to understand what knowledge parents need in order to support the mathematical development of their children. Me: Do you have grandchildren? Him: Yes. They are 8 and 10. Me: Oh nice! So their parents—your kids—are my target market. Him: Yes. Their father is really into that. They use Khan Academy and all that. If the end of that conversation makes no sense to you, I ask that you please, please, please spend the next 15 minutes over at my website, Talking Math with Your Kids. You might be especially interested in the research summaries, which demonstrate that young children need to talk about number and shape with their parents rather than (or at least in addition to) being sent to website, iPad apps and decks of flash cards. Kids need mathematical conversation. And they enjoy it. Mr. Khan? You got some ‘splainin to do! I know we went over this. I know we did. Seriously, Mr. Khan. Gimme a ring next time, OK? I’ll talk you through it. I promise.